Our Spreadit Series are built for durability and are capable of handing many terrains and application styles. Since the 1960s, Newton Crouch Inc has led the industry in fertilizer and lime spreaders and look forward to adding you to our list of satisfied customers. 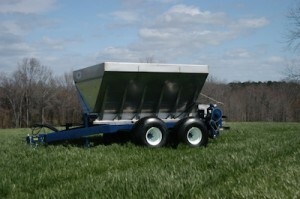 This tandem axle spreader will be tailored with features to ensure you get the best spreader for your farm. Hydraulic valve is an NCI exclusive with an anti-cavitation device, pressure relief valve, and check valve to prevent hooking up to your tractor backwards. Can be used for either an open or closed system. Also has adjustable flow control while under load. This compact valve requires less hydraulic hosing resulting in a sleeker spreader.